Anyone who sees me do the school run every morning can attest to my affinity for the army jacket. I have three of them, each one cut a little differently, all of them indispensable. It's my throw-it-on-over-everything go-to, because it adds style to even the most unstylish outfits (like my workout uniform!). I also like the contrast of an army jacket over something fancy, like a cocktail dress. Here, the zippered pockets, waist-cinching drawstring and cool motorcycle jacket cut yields enduring wear-everywhere greatness. Having difficulty with the Whistles link to this greatjacket...anyone else? Arg! Think the jacket sold out! I will follow up with Whistles and get back to you all! Yup, already have this pair. LOVE them. Thanks Marlien! Not only that but the shirt appears sold out as well! Any other suggestions? Love your suggestions but apparently many others do too! This embellished top is gorgeous! For a moment I thought that top was the Tracy Reese for Neimans for Target one! Oh noooo - love the jacket! Love my army style jacket. I wear it all spring and it goes with everything! Please let us know if they put it back in stock! Marlien, have you had any update on the Whistles jacket? I'm so hoping that more stock becomes available! 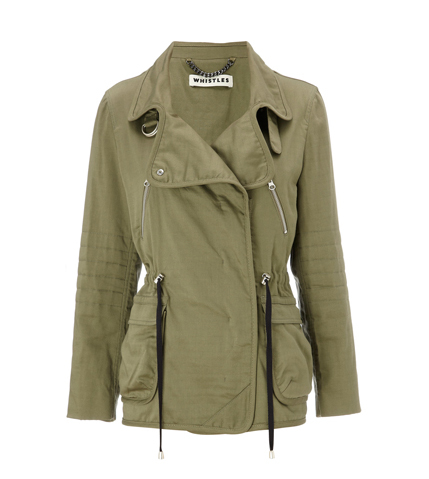 I did hear from Whistles PR and sadly, the jacket is no longer available online. Boo! I will look around for an equally great stand-in! Looks like it's back in stock!